One of Ireland’s most accomplished violinists, Mairéad Hickey was NCH Irish Young Musician of the Year 2010 – 2012. Apart from winning prizes at renowned Irish competitions, she won third prize as well as a Special Prize for the best interpretation of a virtuoso work the 2016 International Louis Spohr Competition and first prize in the Jeunesses Musicales Violin Competition, Romania 2012. In 2017 she was awarded a Special Prize in the Berliner International Music Competition and the Manhattan International Music Competition. Performing regularly throughout Ireland, she has played with both the RTÉ National Concert and Symphony Orchestras. She has performed in every major concert hall in Ireland and abroad in venues including the Royal Festival Hall, London, Beethoven-Haus, Bonn and Carnegie Hall, New York. Born in 1996, Mairéad began playing the violin at the age of three with Jyrki Pietila. From 2003 to 2014 she studied with Adrian Petcu at the CIT Cork School of Music, Ireland and spent a year in France studying at the Conservatoire de Nantes with Constantin Serban. She is now studying with Mihaela Martin at Kronberg Academy, sponsored by the Hilmar Kopper Stipendium. She has taken masterclasses with musicians such as András Schiff, Gidon Kremer, Dora Schwarzberg, Vadim Repin, Mariana Sirbu, Ana Chumachenco, Vadim Gluzman, Yossi Zivoni, Mauricio Fuks, Gabor Takács-Nagy, Christoph Eschenbach, Antje Weithaas, Zakhar Bron, and Ivry Gitlis among many others. An enthusiastic chamber musician, Mairéad has been invited to perform numerous times in the West Cork Chamber Music Festival, the Westport Festival of Chamber Music, the Clandeboye Music Festival and the Rolandseck Festival. Mairéad participated in Chamber Music Connects the World 2016, Kronberg, where she performed with artists including Steven Isserlis and Christian Tetzlaff. She has also collaborated with artists including Barry Douglas, Tabea Zimmermann, Fazil Say, Boris Berezovsky, Pieter Wispelway, Marc Coppey, Mate Bekavac, Michel Lethiec and the Vanbrugh Quartet and often plays as a guest member of Kremerata Baltica. Her love of chamber music led her to co-found the Ortús Chamber Music Festival in 2016 in her native Cork, of which she is Artistic Director. Mairéad currently plays a Giovanni Tononi violin, kindly loaned to her through the Beares International Violin Society. She is supported by the Arts Council and the Music Network Music Capital Scheme, funded by the Department of Culture, Heritage and the Gaeltacht. 24-year-old cellist Sinéad O’Halloran is quickly establishing herself as one of Ireland’s most exciting young musicians. She began her musical studies at the CIT Cork School of Music under the guidance of Joan Scannell and Christopher Marwood. 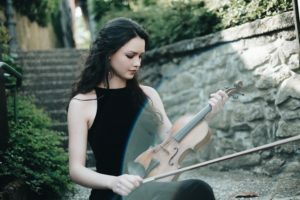 At the age of 18 she was offered an Artistic Merit Scholarship to pursue a postgraduate Performer’s Diploma at SMU Meadows School of the Arts in Dallas, Texas in the classes of renowned cellists Andres Diaz and Christopher Adkins. She is currently a student of Gregor Horsch (Principal cellist of Royal Concertgebouw Orchestra) at the Robert Schumann Hochschule Düsseldorf. An avid chamber musician, Sinéad has performed at IMS Open Chamber Music (Prussia Cove, UK), the West Cork Chamber Music Festival (Ireland), the Banff Centre (Canada), the opening of the Bozar Season (Brussels) and the 25th Anniversary of the Fall of the Berlin Wall (Germany). She has been a prizewinner in numerous competitions, both in Ireland and the US. She has collaborated with musicians including Barry Douglas, Tasmin Little, the Vanbrugh String Quartet and Zoltán Fejérvári. Together with violinist Mairéad Hickey, she is co-founder and Artistic Director of the Ortús Chamber Music Festival, bringing together musicians from Ireland and abroad for concerts, education work and audience development in the wider community. 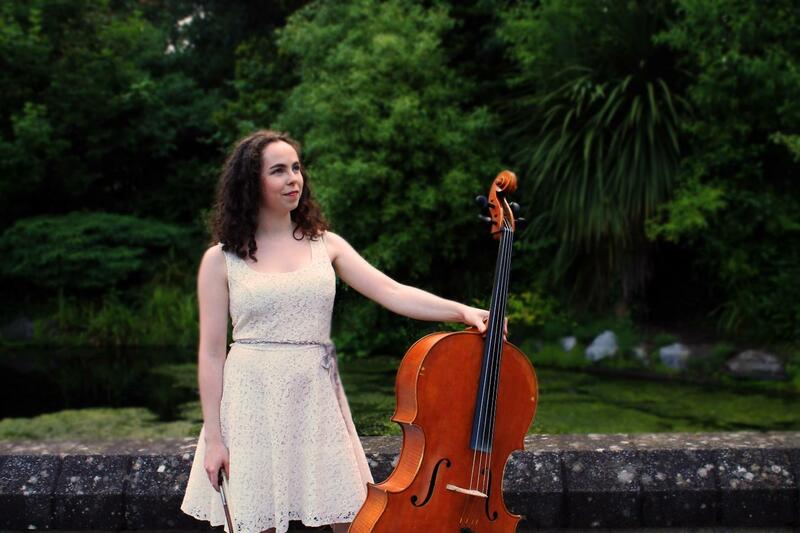 Sinéad is currently Principal Cellist of the European Union Youth Orchestra. She was recently selected by Maestro Ivan Fischer for the Budapest Festival Orchestra Apprenticeship Scheme. She has also performed with the Chamber Orchestra of Europe, Spira Mirabilis, Irish Chamber Orchestra, Georgian Chamber Orchestra and iPalpiti Ensemble of International Laureates. She has performed in some of the world’s finest concert halls under the baton of Bernard Haitink, Gianandrea Noseda, Vladimir Ashkenazy, Jörg Widmann and Vasily Petrenko. 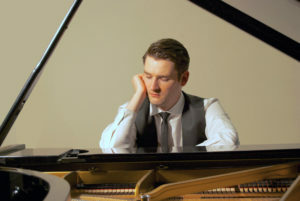 He has performed as a soloist with the Minnesota, Hallé, Moscow Symphony and Bournemouth Symphony Orchestras, City of London Sinfonia, London Mozart Players and all five of the major Irish orchestras, and performed at the Tanglewood Festival, Suntory Hall and Bunka Kaikan Hall, Tokyo, Wigmore Hall, London, Berlin Konzerthaus, Lincoln Center, New York, Symphony Hall, Boston and Pesti Vigadó in Budapest. His critically acclaimed début solo album The Irish Piano was released in 2012 by RTÉ lyric fm and selected as ‘CD of the Week’ by the critic Norman Lebrecht. More recent solo releases include Schubert: Four Impromptus on Ergodos, Miniatures and Modulations on Grand Piano, and a first orchestral album Irish Piano Concertos featuring works by John Field and Philip Hammond with the RTÉ National Symphony Orchestra and conductor Courtney Lewis. His discography of over twenty albums includes releases on Delos, Nimbus Alliance, Champs Hill, Lorelt, Louth CMS and seven duo recital albums on Chandos with Michael Collins. The début album of the McGill/McHale Trio Portraits on Cedille featuring special narrations by Oscar-winner Mahershala Ali was released in August 2017 and immediately entered the Top 25 US Billboard Classical Chart. Upcoming projects include a recording of Strauss’s ‘Burleske’ with the BBC Symphony Orchestra on Chandos, and a recording of two new works by Cliff Eidelman with the London Symphony Orchestra. His 2017-18 season features debuted with the Frankfurt Radio Orchestra (HR Sinfonieorchester) conducted by Christoph Eschenbach and the Seattle Symphony directed by Pablo Rus Broseta, and return engagements with the Utah Symphony under the direction of Matthias Pintscher and the Fort Worth Symphony Orchestra led by Andrew Gourlay. He performs recitals with pianist Albert Cano Smit in Chicago, Aspen, Darmstadt, and at the University of Florida. In the 2016-17 season, William performed with conductor Nicolas McGegan both at the Aspen Music Festival and with the Pasadena Symphony, made his debut with the Oregon Symphony under Carlos Kalmar, performed with the Brussels Chamber Orchestra in Beijing, and played recitals in Paris, Brussels, Virginia and at the Ravinia Festival. He played chamber music concerts with Steven Isserlis at Wigmore Hall in London, with Tabea Zimmermann at the Beethovenhaus in Bonn, and in New York City with the Jupiter Chamber Players. William’s 2015-16 season included his Tokyo recital debut, his debut at the Colmar Festival in France, and recitals in Los Angeles, Brussels, and several cities in Florida. He returned to the Utah Symphony at Deer Valley Music Festival and to the Aspen Music Festival, both as chamber musician and as soloist with conductor Ludovic Morlot, and appeared with the Sofia Philharmonic in Bulgaria and the Shreveport Symphony, among others. 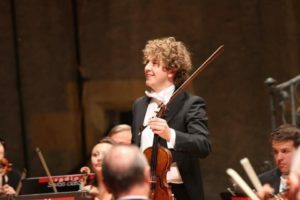 He also played chamber music with Gidon Kremer, Steven Isserlis, and Christian Tetzlaff at the “Chamber Music Connects the World” festival in Kronberg, Germany.Since his debut with the Utah Symphony at age nine, William has performed with conductors such as Marin Alsop, Christian Arming, Placido Domingo, Miguel Harth-Bedoya, Michel Tabachnik and Hugh Wolff, and with the symphony orchestras of Albany, Buffalo, Fort Worth, Jacksonville, St. Louis, Oregon, Utah, and others. Abroad, he has performed with the Brussels Philharmonic, the National Orchestra of Belgium, the ORF Radio-Sinfonieorchester in Vienna, the Orchestre Philharmonique Royal de Liège, and in Japan with the Yokohama Sinfonietta and the Sendai Philharmonic. 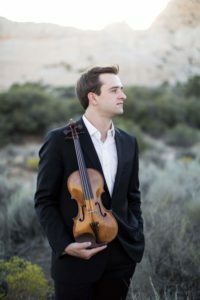 A native of Salt Lake City, Utah, William first heard the violin when he was 3 and began taking lessons at age 4 with Natalie Reed, followed by Deborah Moench. At age 10, he began studying with Robert Lipsett at the Colburn School in Los Angeles, where he studied until the age of 17. After studying at the Juilliard School for two years with Itzhak Perlman, William returned to Los Angeles to continue studying with Robert Lipsett at the Colburn Conservatory. He is currently enrolled at the Kronberg Academy in Germany, where he is a student of Christian Tetzlaff. William is an alumnus of the Verbier Academy in Switzerland, the Perlman Music Program, and the Aspen Music Festival, where he spent many summers. William performs on the 1735 “Sennhauser” Guarneri del Gesù, on generous loan from the Stradivari Society of Chicago. 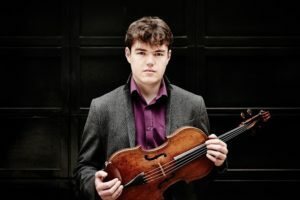 Regarded as one of Ireland’s most promising musicians, international award winning violinist Patrick Rafter has toured Europe, Asia and America as Concert Violinist, Chamber and Orchestral musician, and currently studies under Maxim Vengerov and Oleg Kaskiv at the International Menuhin Music Academy Switzerland. Most recently, Patrick was awarded 1st prize at the Valiant International Violin Competition in Switzerland 2016. In 2011 Patrick was awarded a scholarship to study at the Royal Academy of Music (RAM) London, where he graduated with first class honours and was awarded the highest mark in his year group. At RAM, he was concertmaster of the Symphony, Concert and String Orchestra and was also selected as a member of the RAM’s elite string ensemble ‘Sainsbury Royal Academy Soloists’ with whom he made his Wigmore Hall debut in January 2015. During his time at the RAM, Patrick was a recipient of a host of awards including the Foundation Award, the Sir Curtis Price Award, Roger and Sarah Bancroft Award and the J E Reckitt Award. Patrick has performed as a soloist with multiple professional orchestras including RTE Symphony Orchestra, Mannheim Chamber Orchestra, Camerata Ireland, Kiev Soloists amongst others and this season will see debuts with London Mozart Players, Prague Philarmonia among others. In October 2015, Patrick was personally invited to study under Maxim Vengerov at the International Menuhin Music Academy (IMMA), Gstaad Switzerland and has performed as soloist and concertmaster with IMMA’s elite chamber ensemble. During his career, Patrick has studied with and performed alongside some of the greatest performers and teachers in the world today, including Maxim Vengerov, Schlomo Mintz, Barry Douglas, John O’Conor, Igor Ozim, Serjei Krylov, Reiner Honeck, Maurizio Fucs and Graf Mourja. He has also worked with some of the leading composers of the world today, such as Arvo Part, and performed with some of the greatest conductors including Semyon Bychkov, Marin Alsop, Sir Mark Elder and Gianedra Noseda. As a conductor himself, Patrick has directed the RTE Concert Orchestra in the finals of the RDS Feis Ceoil Conducting Competition and has taken choral masterclasses with distinguished names such as Zoltan Pad, Maxim Vengerov and Volker Hempfling. Patrick is incredibly grateful to play on a Georges Chanot violin kindly supported by the Department of Culture, Heritage and the Gaeltacht. Since winning 1st Prize in the Lionel Tertis International Viola Competition in 2016, Timothy Ridout has gone on to perform widely in Europe. This disc contains some of the best music written for the viola in the 19th Century….Timothy Ridout…is a fine, young violist with a solid tone, perfect intonation, solid technique, and charisma. I look forward to hearing more from him. A gorgeous tone, a thoughtful approach to phrasing and an infectious sense of impetuosity. Ella van Poucke, born in Amsterdam in 1994, winner of the prestigious Premio Chigiana 2017, the 23 year old Dutch cellist belongs to the top rank of today’s generation of cellists. She is the first prize winner of the International Isang Yun cello competition 2015, the Leopoldinum Award 2015, Prix Nicolas Firmenich 2013, Elisabeth Everts Award 2014, Prix Academie Maurice Ravel 2012, Dutch Musician of the Year 2012 and first prize winner of the 2008 Princess Christina Competition. After making her debut at the Concertgebouw at the age of 10 she has been performing in all the major halls of the Netherlands, in many top halls in Europe and in the U.S and Asia. As a soloist Ella has performed with the Netherlands Philharmonic Orchestra, HRSinfonie Orchester, Brussels Philharmonic, Rotterdam Philharmonic Strings, Varsovia Chamber Orchestra, Polish Chamber Orchestra, Dutch National Youth Orchestra, Maggio Musicale Fiorentino, Orchestre della Toscane, Württembergisches Kammerorchester Heilbronn, Junge Sinfonie Berlin, Hamburger Camerata, Tongyeong Festival Orchestra and collaborated with artists as Michael Sanderling and Christoph Eschenbach among others. In November 2012 she premiered a new concerto, which was written for her by the Finnish composer Uljas Pulkkis during the Cello Biennale Amsterdam. In September 2013 she premiered the same work in Germany at the Kronberg Festival. As a passionate chamber musician Ella has performed with Andras Schiff, Nobuko Imai, Tabea Zimmermann, Christian Tetzlaff, Viviane Hagner, Lawrence Power, Gidon Kremer, Colin Carr, Vilde Frang, Philippe Graffin, Prazak quartet, Schumann quartett among many others. She regularly performs in recital with pianist Jean-Claude vanden Eynden and with her brother Nicolas van Poucke. She has been guest in numerous international festivals such as Festspiele Mecklenburg Vorpommern, West Cork Chamber Music Festival, Music@Menlo, Krzyzowa Music, Chigiana International Festival, Kaposfest Hungary, Internationaal Kamermuziek Festival Utrecht, Kronberg Festival, Cello Biennale Amsterdam and was invited to participate in Verbier Festival Academy in 2009, 2013 and 2014. As a Dutch ‘Rising Star’ Ella was invited to give two Carte Blanche concerts in the Concertgebouw in Amsterdam in 2013-14. Ella is the artistic director of the Chamber Music Festival Amsterdam which she and her brother, pianist Nicolas founded in 2010. Born into a family of musicians, Ella began playing the cello at the age of six. Entered the Royal Conservatory of The Hague at the age of 10 and later continued her studies in Amsterdam with Godfried Hoogeveen. She has had masterclasses with Daniel Barenboim, Miklos Perenyi, Yuri Bashmet, Steven Isserlis, Menahem Pressler, Laurence Lesser, Anner Bijlsma, Bernard Greenhouse, Mischa Maisky, the Emerson Quartet among others. From 2009-2016 Ella studied with Frans Helmerson at the Kronberg Academy Masters in Germany. Currently Ella is Artist in Residence at the Queen Elisabeth Music Chapel in Brussels, where she studies with Gary Hoffman. She plays on a Rombouts cello, kindly lend to her by a anonymous benefactor. 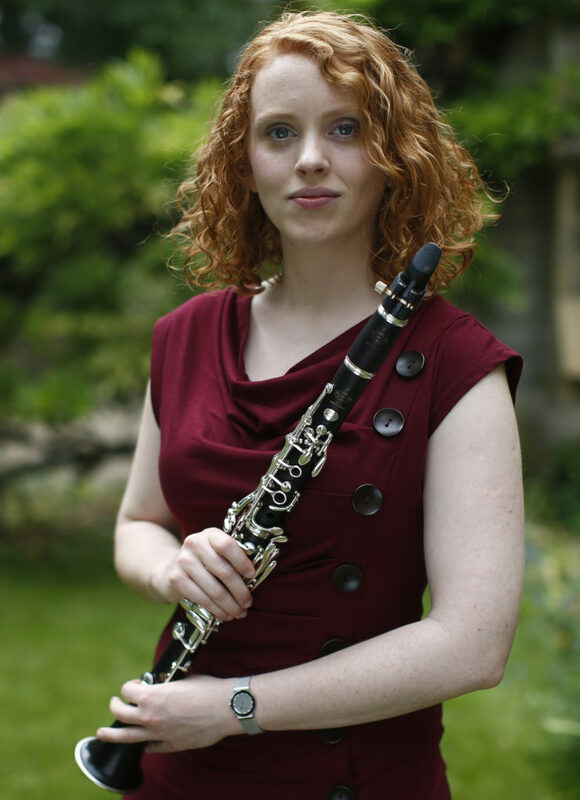 London based Irish clarinettist Jessie Grimes balances a busy schedule performing as a soloist, chamber musician and orchestral player, as well as a teacher, presenter and workshop leader. She has performed as a soloist at the Purcell Room, St John’s Smith Square, St Martin-in-the-Fields, NCH Dublin and at the Brighton Festival. Jessie is a founding member of the Jacquin Trio, with whom she has won many awards and competitions including the Royal Overseas League Competition and St Martin-in-the-Fields Chamber Music Competition, the Salzburg Grand Prize Virtuoso International Competition, and the 19th International Chamber Music Competition, Thessaloniki. A lover of chamber music, she also enjoys a musical relationship with the Dr K Sextet, Ensemble Perpetuo, The Riot Ensemble and Ossian Ensemble. As an orchestral musician, Jessie been principal clarinet of the Wexford Festival Opera Orchestra for the past three seasons and also enjoys working with orchestras such as the BBC and RTE Orchestras, ROH Covent Garden and Camerata Ireland. As a student she enjoyed many tours with the European Union Youth Orchestra as principal bass clarinettist. Jessie is passionate about sharing her love for music. She teaches clarinet at the Royal College of Music (RCM) Junior Department, and has given woodwind masterclasses for the Camerata Ireland Academy at the Clandeboye Festival. She has presented live on BBC television, is a Live Music Now mentor for young ensembles, and delivers workshops for Create Arts, Wigmore Learning, Camerata Ireland, Spitalfields and RPO Resound. She also works closely with with the Ulster Orchestra, presenting concerts and workshops, and developing their Learning and Participation programme. Uilleann piper Fergal Breen from County Clare has been playing classical and traditional music from the age of 8. He is a multi-instrumentalist, playing uilleann pipes, classical and traditional piano, organ, traditional flute, tin whistle and low whistle. He has won many accolades, including three All-Ireland solo titles on the uilleann pipes. 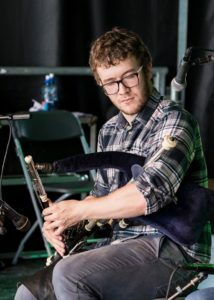 In 2014 he won the All-Ireland under 18 concert flute and tin whistle titles, as well as coming second in the under 18 uilleann pipes competition. He has also been a member of The Burren Group and Burren Ceílí band since the age of 9, winning several All-Ireland titles with these groups. He has been part of the Seisiún group at Cois na hAbhna for the past four seasons. In 2010 and 2012 he won awards at the Meitheal Summer School for musicianship, which included a visiting music teaching position at the Cavan Traditional Music Weekend in 2012. He was a member of the band ‘Dílse’, who performed on two occasions at The National Concert Hall in Dublin at the finals of Siansa Gael Linn. He has performed as uilleann piper and low whistle player for The Clare Memory Orchestra. He has completed a diploma on piano with the London College of Music and he plays the organ at the Cathedral in Ennis. A student of Biomedical Science at the National University of Ireland, Galway, he continues to perform regularly, both locally and nationally, including several radio presentations. He also teaches Irish traditional music with Comhaltas Ceoilteóirí Éireann in Galway.